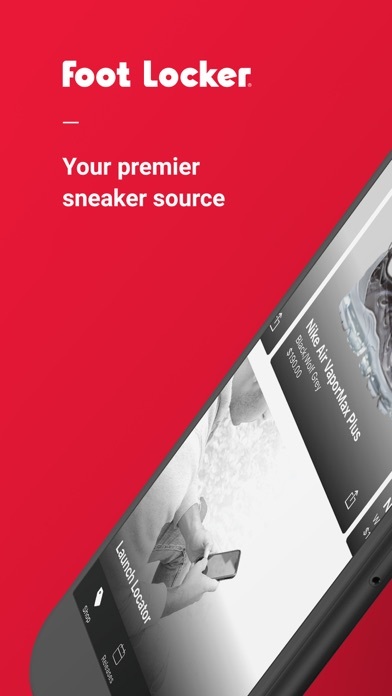 The Foot Locker App is your source for all things sneakers. • Quick and easy shopping of the latest footwear and apparel at Foot Locker at your fingertips. • Shop the hottest brands like Nike, adidas, Jordan, Champion, and adidas Originals. • Stay ahead of the game with the Release Calendar. Add reminders to your own calendar to never miss a drop of the hottest kicks. • Enable push notifications for your chance at new shoe releases as soon as they go live. • Launch Reservation gives you a chance at reserving the hottest sneakers for in-store pickup the day they release. 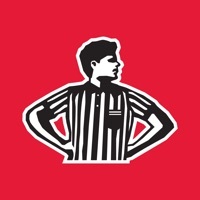 • Become a Foot Locker VIP! 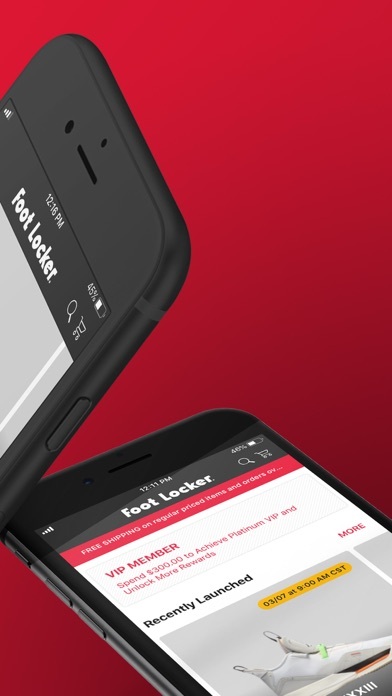 As a Foot Locker VIP, you can access your account, track your order status and spending, check your rewards, and stay up to date on hot shoe releases. • As a VIP, you will be sent exclusive offers including an annual birthday discount and early access to sales. Platinum VIPs are automatically upgraded and receive additional rewards to use on purchases as well as access to exclusive events and giveaways. • Get an in-app VIP card to scan in stores. • Find the nearest Foot Locker stores with the Store Locator. Shop Foot Locker anytime, anywhere! I was looking for shoes using the filter, but the app never gave me results. Please work on the app. This is app is simply terrible in all seriousness. 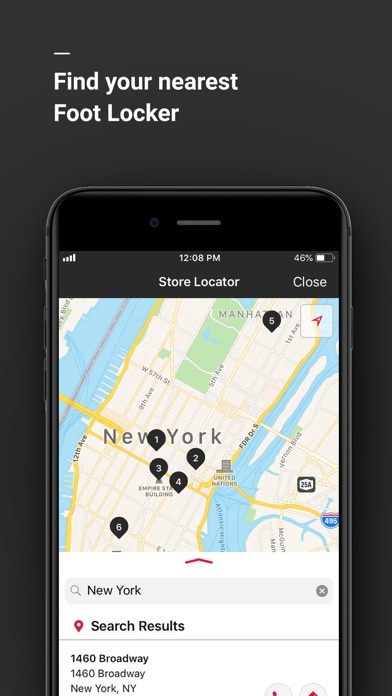 Absolutely the worst app have experience 2018/2019 I can’t never find what I’m searching for, it always say “ no results “ the old footlocker version was WAY better . Also when I order my VIP points does not appear within 48 hrs . This app needs some serious improvement!!!!! Now that the military discount feature was disabled, this app is useless to me. This feature needs to be replaced ASAP. I received the wrong shoes and it’s a struggle trying to get my money back. I was not given a return form and now it’s going to take 24 hours just for a return form through the email. Also I’ve been told they don’t have my shoes in stock so I can’t even get the pair of shoes I originally ordered. Right now I am very heated and angry with this company and can say that I refuse to spend any money there any more. What’s wrong with Footlocker; they can't handle the online service?!!! Neither the app nor the website works properly. Both the app and the website keep failing to sign in then to purchase. By far one of the best apps on the store a sneaker heads need that one app in this is that one app I run to when I want to keep up-to-date with my sneakers and Jordans etc. sadly there’s no way to add the sneakers to a wish list or favorites list so I can work on a collection would like to see more features soon. I can’t understand what the deal is with this app. I’ve tried to login and it just keeps telling me that something went wrong. BS. I was trying to purchase the new Yeezys for my nephew, but the app kept crashing. Even the website kept crashing. 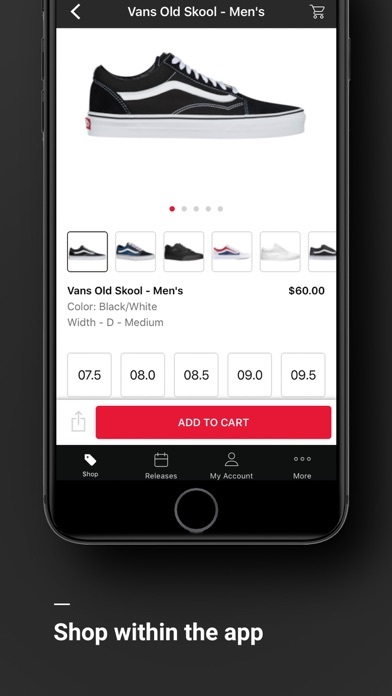 Very disappointed in Footlocker not being able to manage a better app/site. Meanwhile, I’m sure all the boys got their hands on shoes. If you’re looking to cop some limited release or just something fire don’t use this app. Apparently the app can’t take too much traffic. Forgot my account when I was alright logged in, then when I tried to log in it says account not available at this time. Plus I hear they don’t have anything to fight against bots, so don’t count on getting something from this trash app. The app has something wrong it doesn’t download the imagine has to fix that problem buddy. I’ve been trying to log in for a week. I reset my password, deleted and re-installed the app, and nothing. It tells me “Request Failed” when I try. I can access the mobile site just fine, but I can’t get in on launches without the app. Typical Foot Locker BS. SNKRS has us all spoiled, I guess. I’ll go back to Finish Line or Shoe Palace for my chances at limited releases. You can’t search for anything on the app! Please fix the problem where you have to log pretty much every time you use the app. It’s so annoying. I used previous versions of this app frequently. Now, it’s absolutely awful to use. Can’t find categories. Can’t find but a few kid’s shoes. Terrible. You would think that it would be the logical thing to do. You can shop on the app and make purchases but you can’t view your order or shipping confirmations on the app. This should heave been one of the first things available. Nike has it, Under Armour has it. Why can’t Foot Locker? Apparently you can’t order kid shoes via the app highly frustrating. This app is not user friendly and every time you try to register for new releases or vip it give you an error. Cant access rewards, VIP card, or spending status. Call the VIP customer service and they’re no help at all. Footlocker has had years to get this right and still cant. So lame. It would have been nice to know this beforehand. What to do if a shoe reserved and the 3 stores you’ve chosen don’t have your size? The app let’s you reserve but when it comes to buying your SOL. The app always crashes when new shoes come out and logs you out by itself every time I don’t use it for a day or so... this doesn’t make any since a multi million if not billion dollar company can’t get it right. Every time there is a new release the app crashes. You would think by now the developers would be aware of the amount of people who try to access the app of hyped sneaker releases. I been trying all the time to win but have never won through the reservation launch. I rather show up to the store and pick up a raffle ticket over a system that always says next time. HELLO McFly!!! ANYBODY IN THERE?? THINK FOOTLOCKER THINK!! Two months of reviews that people can’t log in and no one has any idea of what’s going on. Why make it so difficult to give you our money?! Isn’t the purpose to you know, sell some product? After I spend my rewards I’m going to go to an app/store I can actually use. 3 months back and forth with customer service did nothing. New password, invalid. Forgot your password, never receives email. Yes I checked the junk folder. Email is valid and active but still can log in to anything other than the desktop site. Can’t enter to reserve, can’t anything. It’s 2019 let’s clean these types of bugs up in our apps and software please! Several basic links don't work, especially when filtering. Pretty annoying. Also, the app is very limited in capabilities. I couldn't even check my order status through the app. I'm having these issues outside of the limited release window. I’m trying to make an account but it won’t let me. I even did the robot test. This app is terrible, on release dates all you get is blank screens! It sends you notifications and when you tap on it you get nothing!! 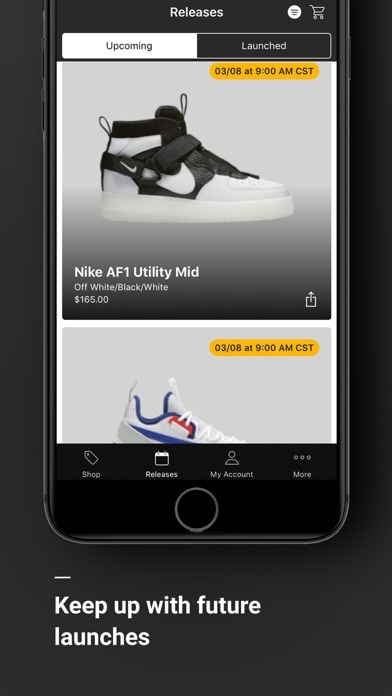 SNKRS app is where I buy new release Nike products from, much faster and better success! I spend a lot of money with FootLocker, this app is no help at all!! This app really needs to be redeveloped!! By far the worst sneaker app. Crashes daily or states request failed. First of all I have been a fan of Footlocker and always shop there for my shoe needs. This app has some issues with the VIP system. 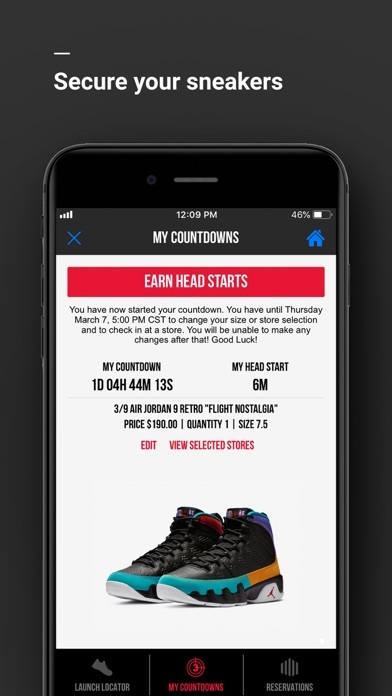 I recently (2/14/19) downloaded the app while in the footlocker store for a head start reserve on a release. I did everything as directed, the employee helped me input whatever number or code to register and I thought all was fine. I made my purchase that day and left. Now upon picking up the sneakers I reserved and trying to use the coupon I thought I was entitled to is when I ran into the errors. My app will not display my VIP status but shows up on the in store computer. Very confused, I removed and reinstalled the app and still same problem. The employee at the store said I was entitled to a $20 discount on my next purchase of $50 or more but it does not show on my app. Everybody else in line that day used there phones to receive the coupon code I was also entitled to. By no means is $15 off a reason to bicker but my issue is I was entitled to this as well but because of the app not allowing me to become a VIP member until AFTER I left the store is surely an eye opener. When I open the app the option to become a VIP member is displayed but when I click it, it just says congratulations and freezes or an error occurred message shows. I believe the app needs some sorting out at least mine does. Whether I’m on the app or the actual website, every time I try to look for kids sneakers I either get a message that no items were found, or two items come up. Women’s and men’s search is fine, it’s just kids.